Morsi along with members of Hamas and Hezbollah to be tried for a prison break and the murder of officers during the 2011 uprising. 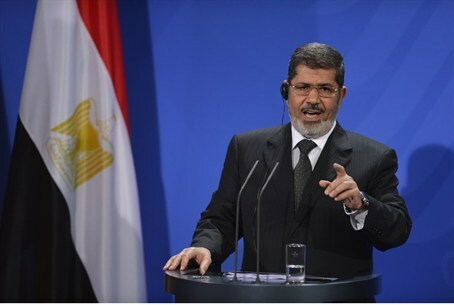 Egypt's deposed president Mohammed Morsi will be facing a third trial, the local prosecution said Sunday. Morsi and 132 others, including members of Hamas, will stand trial for a prison break and the murder of officers during the 2011 uprising, according to a report by the AFP news agency. Almost 70 of the defendants are members of Hamas and Hezbollah and they will be tried in absentia, the report said. It will be the third trial announced for Morsi on separate charges, amid a crackdown on his Muslim Brotherhood movement following his overthrow in July. At least two of the Hamas inmates, including leader Ayman Nofal, have been indicted, the prosecution sources said. A Hezbollah commander named Mohamed Mansur, convicted in 2010 of plotting attacks in the country and who escaped, was also charged, reported AFP. The other defendants include leaders of Morsi's Muslim Brotherhood, who also escaped from the Wadi al-Natrun prison during the revolt, and prominent Qatar-based cleric Yousef al-Qaradawi. Morsi had been under investigation for the January 28, 2011 prison break along with Brotherhood members. The ousted president is already on trial for allegedly inciting the killings of opposition activists during his one year in power. In addition, just this week prosecutors announced he will also stand trial for espionage involving Hamas.